Barbecue, or as we have always called it, BBQ is just not the same without a good sauce. I’d like to share three of mine today. They are all good on any kind of meat or grilled seafood. This first one is very simple and is particularly good on chicken. The second takes a little time but is worth the wait. It’s excellent on pork. The third is perfect when grilling fish or shrimp. It can be used to baste the seafood while it is grilling or is also good as a marinade before grilling. Mix all together and heat over medium heat until mixture comes to a boil. Remove from heat. Use immediately. In a large, deep pot, saute the garlic and onion in the butter. Mix in remaining ingredients. Allow to simmer for 45 minutes adding water if it becomes too thick. Let cool 10 minutes before using. I promised you one of my “notebook recipes” today and this is the one I picked. This is great as a brunch. In a large bowl, mix together meat, celery, bell pepper and onion. Set aside. In another bowl, mix together mayonnaise, cream, vinegar and salt and pepper. Mix into meat mixture well. Chill for at least one hour or overnight covered with plastic wrap. Stir once before serving. Tastes great served with cranberry sauce or a tart jelly. Feeds 4 – 6. *If using canned chicken, break up the chicken chunks with a fork before mixing with other ingredients. This is so yummy you’ll want to eat it all yourself! Combine the orange juice and cornstarch in a shallow glass bowl. Add the chicken strips and stir to coat them well with the marinade. Cover and chill for 2 hours. Drain and discard remaining juice. In a small bowl, mix together the broth and soy sauce. Set aside. In a wok or skillet, heat the oil over medium heat. Add the garlic and ginger and cook and stir for 30 seconds. Add the chicken and cook and stir for 3 minutes. Add the vegetables and cook and stir an additional 5 minutes. Stir in broth/soy sauce and heat through. Remove from heat. Place about ¼ cup of rice on separate plates. Top with chicken mixture and serve hot. Feeds 4 – 5. One of the great things about the Campbell’s website is the Meal Mail they send out. There are several different Campbell products that you can choose from to receive Meal Mail from and they send recipes using those products right to your email every day. I have, of course, signed up for Meal Mail on every product LOL Today I received my Meal Mail using Swanson® products. Cook the chicken in a 10-inch nonstick skillet over medium-high heat for 10 minutes or until it’s well browned on both sides. Remove the chicken from the skillet. Stir the stock, orange juice, onion and rice in the skillet and heat to a boil. Reduce the heat to low. Cover and cook for 10 minutes. Return the chicken to the skillet. Cover and cook for 10 minutes or until the chicken is cooked though and the rice is tender. Stir in the parsley. 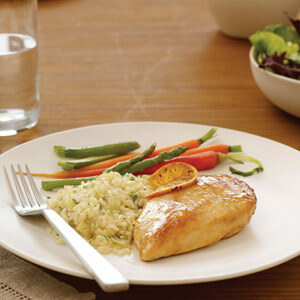 Tip: For a special touch, cook orange slices in a nonstick skillet over medium-high heat until they’re lightly browned. Serve over the chicken.